A binned HIE report on digital technologies. 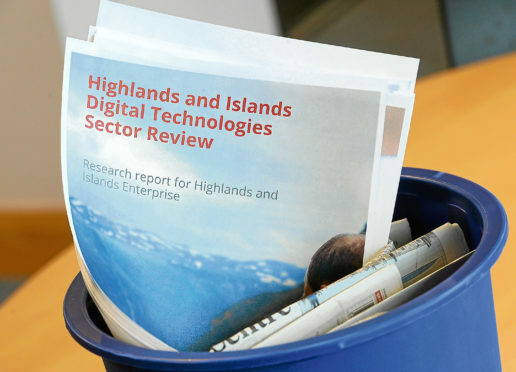 Highlands and Islands Enterprise (HIE) has had to backtrack after “mistakenly” publishing a report containing criticism of the region’s university and its ability to support growth of the digital technology sector. With a remit to “inform HIE’s strategy for developing and growing the digital technologies sector” in the region, the report sets out findings of an £8,000 research project by Linlithgow-based organisation ScotlandIS. In a section highlighting weaknesses in the area, the consultants wrote: “The cross-fertilisation between academia and businesses remains limited as the only university in H&I has no research specialism in computing science or related subjects, apart from digital health. “Digital technologies also do not feature in the list of subjects which have been identified by UHI as areas of opportunity to develop its research capacity. Following questions from the Press and Journal, HIE this week pulled the document from its website, where it had been posted several days ago, claiming it had not been intended for publication at that stage. A spokesman said: “The report was designed as a working document to help the public sector, academia and businesses look at the best ways to develop our science and technology sector. “Since this paragraph has been brought to our attention we recognise that, when looked at in isolation, it does not accurately reflect the full breadth of activities, either by the University of the Highlands and Islands, or indeed the many other universities working in the digital field in the region. Susan Engstrand, subject network leader in science, technology and the environment at UHI, said the university aimed to support the digital requirements of industry in the region and had links with local and national businesses. ScotlandIS, which is a not-for-profit organisation, declined to comment.